Brunch: quite possibly one of the best inventions ever. It makes my Sundays worthwhile despite Monday quietly looming around the corner. The sun shines brighter, my to-do list disappears, and nothing can go wrong. Sundays that begin with brunch are destined to be amazing. It’s the little things. 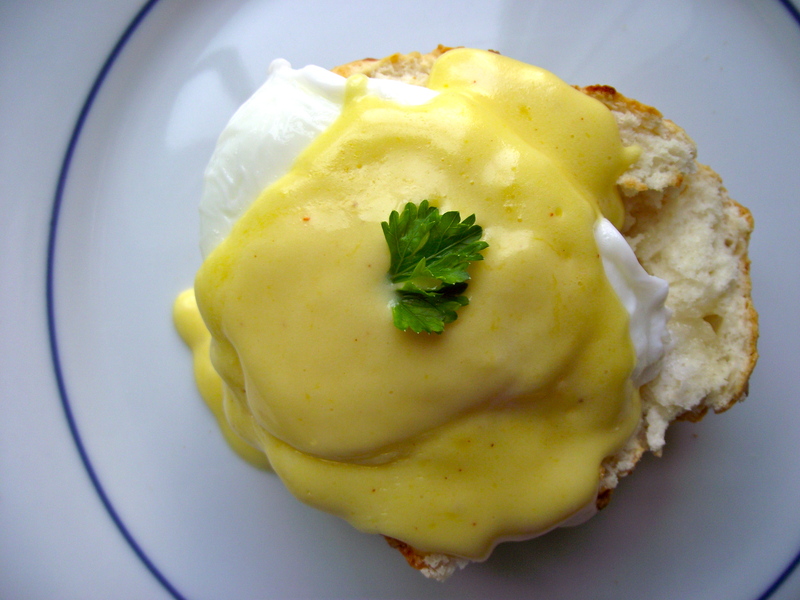 One of my absolute brunch favorites includes the ever-decadent Eggs Benedict. I refuse to gain insight on its caloric contest lest it change my feelings towards this staple item. But it probably won’t. And since I indulge in it only upon occasion, I figured that’s enough to justify my blissful ignorance. Eggs Benedict also happens to be one of my sister’s favorites so when I visited her over the summer, we decided to take it upon ourselves to make brunch instead of following our initial intentions of dining out. The decision couldn’t have been better. It would be near criminal to keep this recipe to myself. The assembly requires some orchestrating but you’ll find your own rhythm after making it a few times. Step 1. 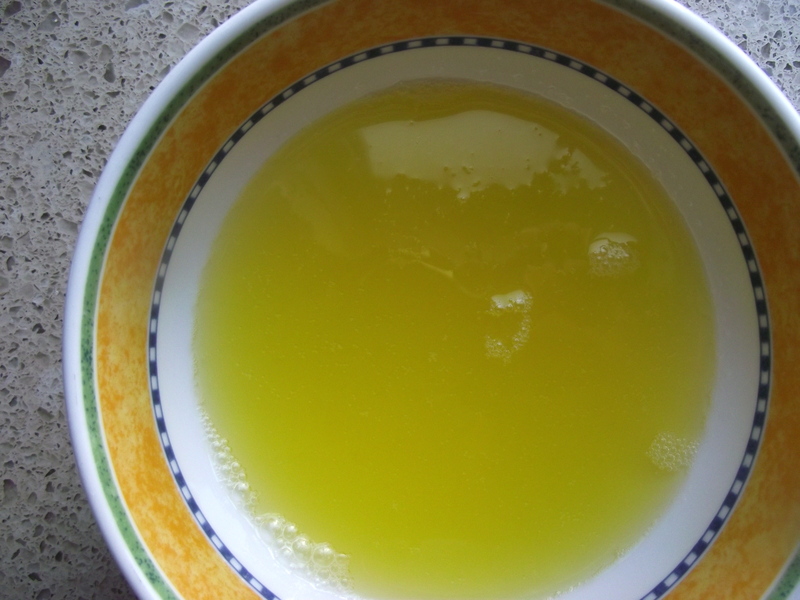 Make the clarified butter. In a small pot, melt the butter over low heat. Have a spoon and an extra bowl handy. 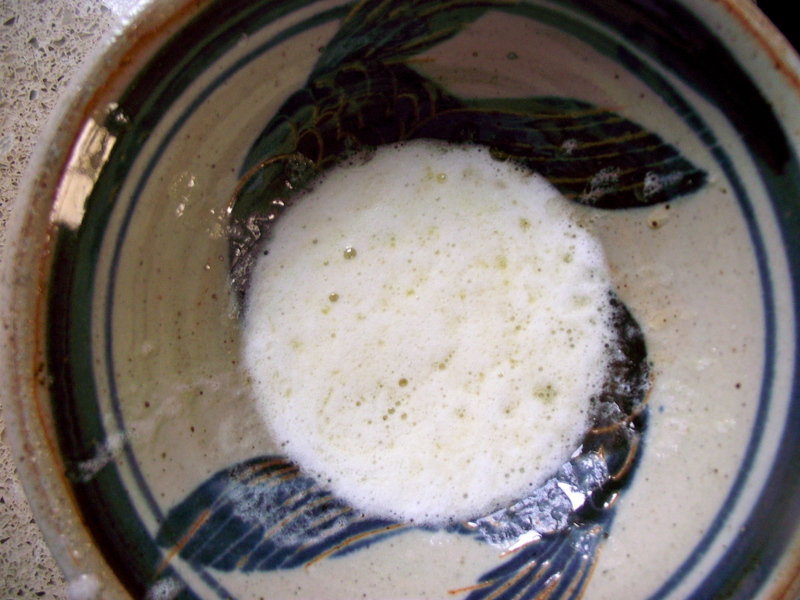 When the butter starts to melt, skim off the white foam from the surface with a spoon and continue until all white foam is removed. What’s with the white stuff? The foam is comprised of milk solids and water, which separates, leaving behind the golden yellow butterfat. Step 2. After all the white foam is skimmed from the surface, turn off the heat and slowly transfer the clarified butter into a separate bowl. Set aside. Step 3. Get your cooking apparatus ready: Fill a saucepan with 1-2 inches of water and get it simmering on the stove. We will use the steam, rather than direct contact with the water to heat the sauce. What kind of science experiment is this!? Step 4. In the meantime, add the egg yolks and cold water in a separate bowl. You can use any heat-safe bowl except aluminum. 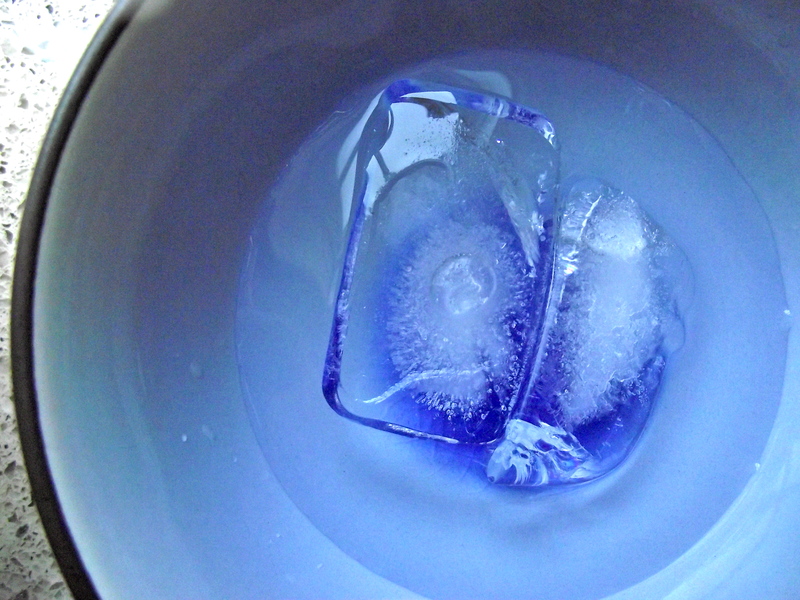 I used cold water from melted ice cubes. Or you can stick a small dish of water in the freezer for a few minutes, while you clarify the butter. Step 5. 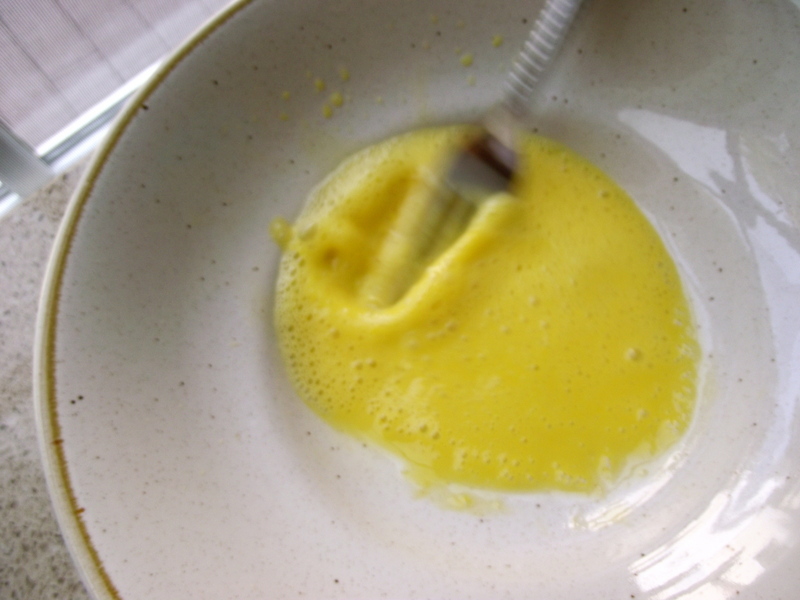 Whisk the egg yolks and water until you achieve a light and foamy mixture; about a minute or two. Step 6. 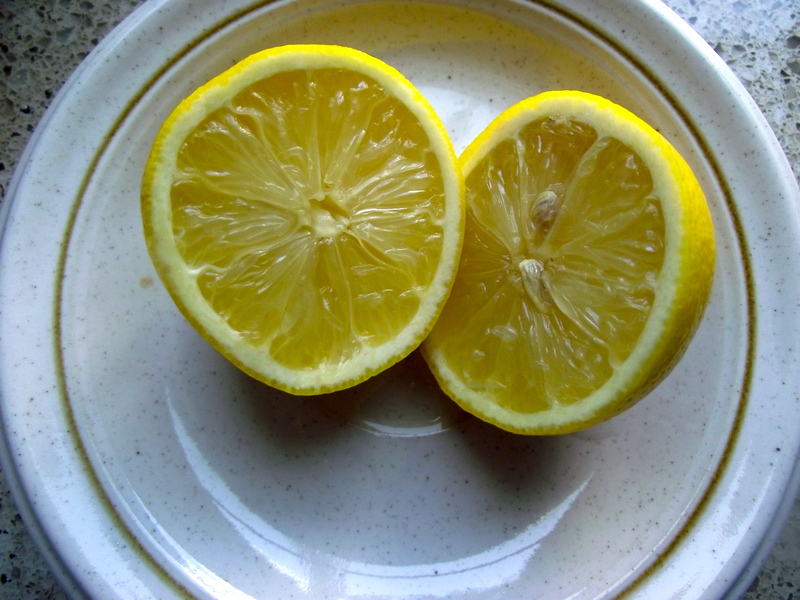 Whisk in the lemon juice, too. Step 7. Once the water in the saucepan is simmering, place the heat-safe bowl on top. 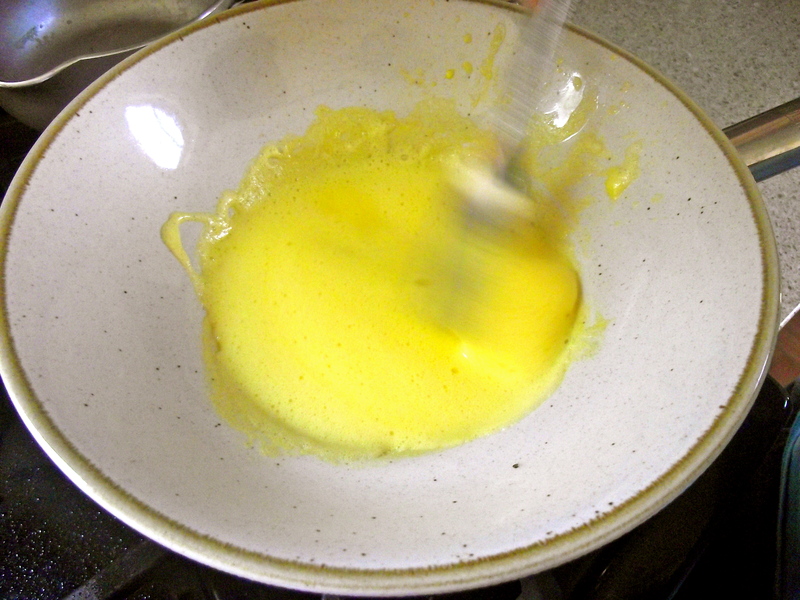 Whisk the egg yolks gently until they slightly thicken. Make sure to keep the heat on a low gentle simmer to prevent getting scrambled eggs. This low and slow method helps the butter and eggs bind well with each other. It’s a relationship meant to last. Step 8. 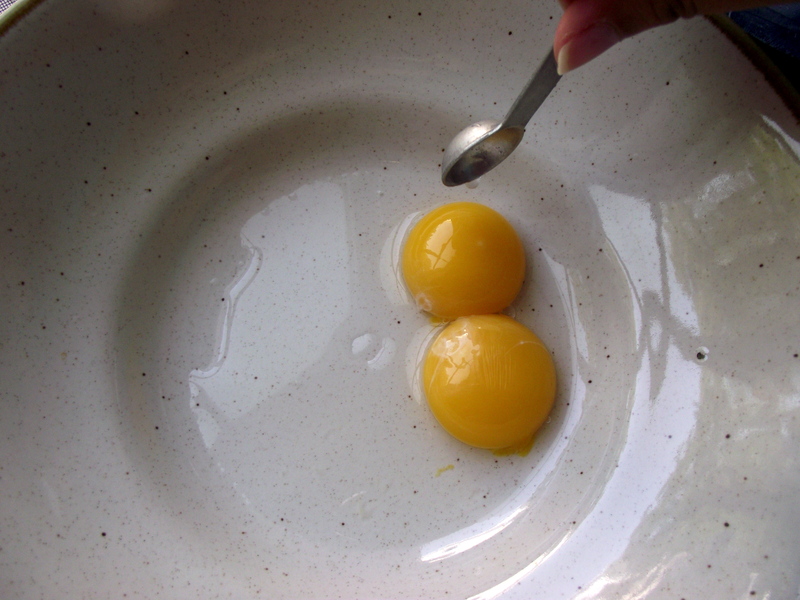 When the egg yolks are slightly thickened, remove the bowl from the heat. Slowly, begin adding the butter a teaspoon at a time while whisking. As you continue whisking, the sauce will start to thicken and at this point, you can add larger quantities of butter a time (think steady stream v. drop by drop). 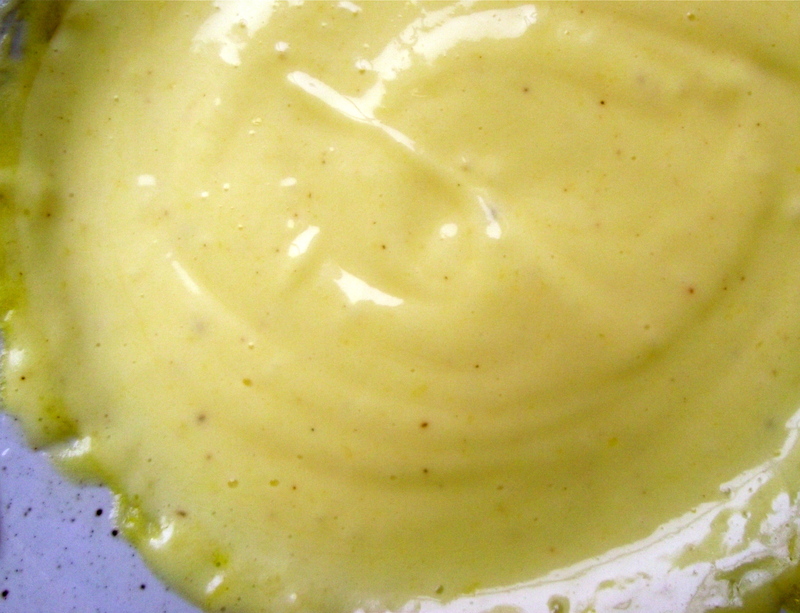 Take it easy on the whisking; rapid fire will separate the emulsion. Season with salt and cayenne pepper to taste. And I really mean, taste, taste, taste! The finished texture should be smooth yet firm. Add a few drops of warm water and whisk if the sauce is a bit thick. Done! Set aside. Step 9. Poach the eggs. In a saucepan, heat about 4 inches of water and heat until it is nearly boiling. Add just a tiny amount of vinegar. This will help to solidify the egg. While waiting for the water to reach almost boiling, crack an egg in a bowl and get a slotted spoon ready. Remove the warm biscuits from the oven, and slice them in half. 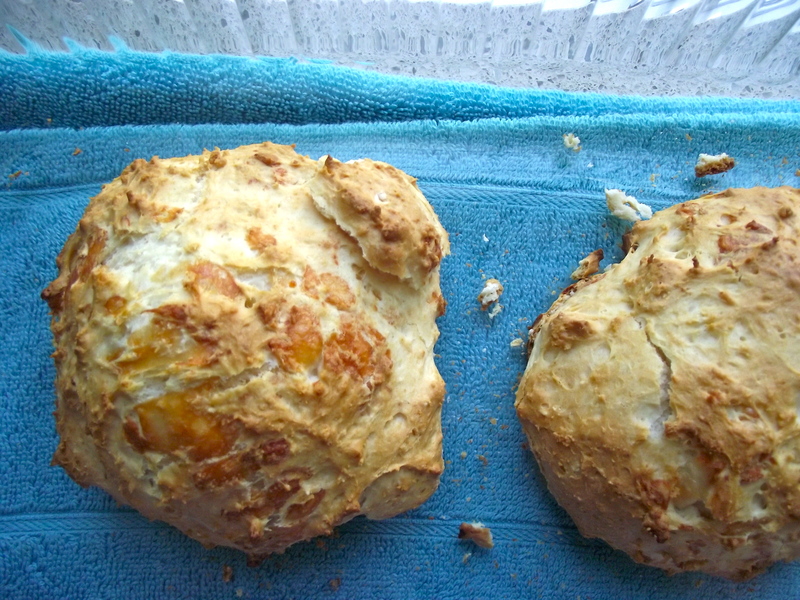 We used Bisquick to make ours and used the directions on the box to make these biscuits, aka yolk soakers. Step 10. When the water is near boiling, gently pour the egg into the pan and slowly push the eggs whites closer to the yolk as it continues to cook. 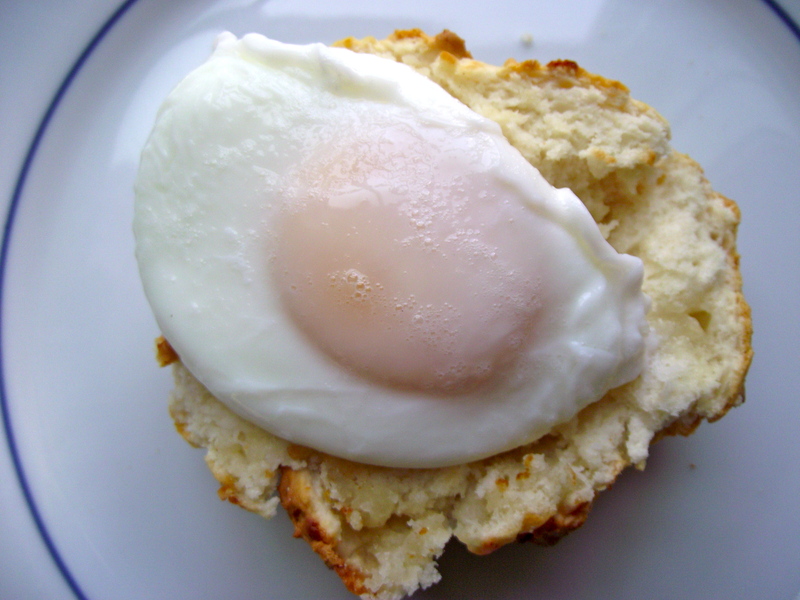 Allow to cook for 3-4 minutes then take the egg out with a slotted spoon. Place directly on top of the halved biscuit. Step 11. Spoon a bit of Hollandaise Sauce (or in my case, a lot) over the poached egg and garnish with a bit of parsley. Voila! 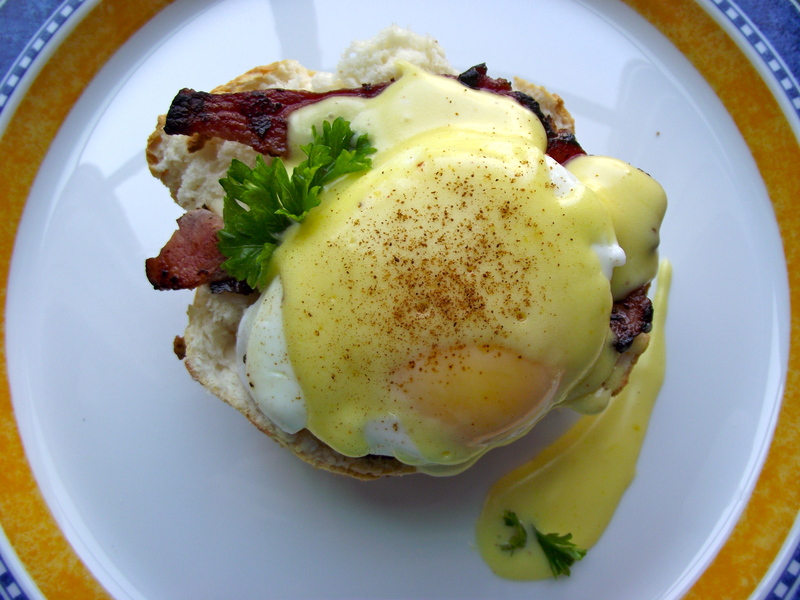 Or, if you’re like my sister, do it up with Canadian-style bacon and a bit of cayenne pepper on top to finish it off. Either way, you’ve achieved something delicious, satisfying and most definitely worth all the hard work. Enjoy!